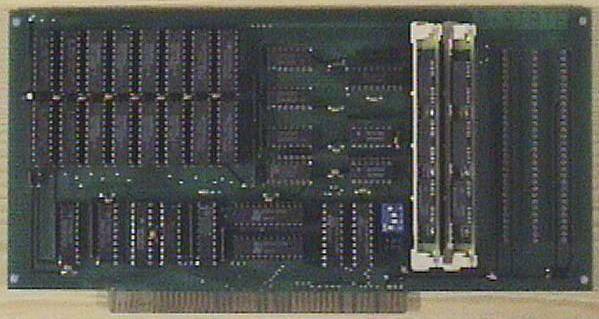 Ram Type: Mixed DRAM Chips, 30pin SIMM slots and 30pin SIP slots. Full length Zorro II which allows the addition of up to 8MB of RAM. There are several versions of the Megamix 2000 card, two of which are shown here. The three DIP-switches control the amount of memory. The first 2MB were made up from 44256 ram chips, so the smallest configuration is 512K. Next step was 1MB, and 2MB with all 16 chips installed. The SIP modules have to be added two at a time, because they are only 8-bit wide. SIP modules have the same pinout as SIMM modules, but the company wanted to save the money for the expensive sockets. The board can be easily equipped with SIMM sockets. The two jumpers can swap the 16-chip bank and the last SIP bank. This allows using the board without 44256 chips, because the chip-bank becomes the "last bank". The Megamix 2000 is almost identical to the Masoboshi Fast RAM 2000 and made have been made under license. Page contributors: Iggy Drougge, Jan Dwornizky, Jens Schönfeld (Individual Computers), RiWa & Friends.